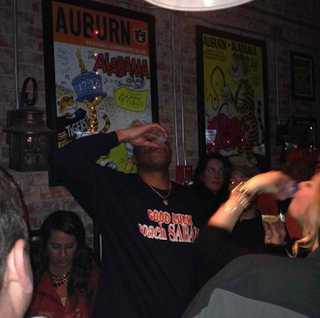 Former Tiger Charles Barkley was spotted out in Auburn last night, prepping for his alma mater's matchup with Alabama in today's Iron Bowl. Here's a relevant paragraph published earlier in the week. Barkley will travel Friday to Auburn to soak in the atmosphere, address the team and make a few public appearances before the Tigers' showdown with No. 1 Alabama (11-0, 7-0 SEC). He expects No. 4 Auburn (10-1, 6-1) to win, and the key to victory will be quarterback Nick Marshall. So far, so good, Chuck.